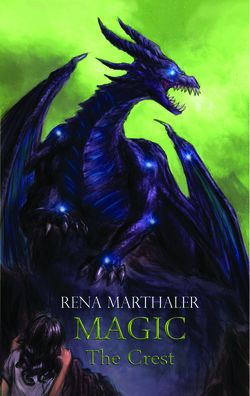 Magic The Crest is a 128-page fantasy adventure novel by eleven-year-old Portland author Rena Marthaler. Rena wrote Magic through participation in the Young Writers Program of National Novel Writing Month, 2013. She wrote the sequel during NaNoWriMo 2014 and is currently editing it. Rena has written about other books and other young writers at renamarth.wordpress.com. Click on the images below to read more about Magic The Crest. Contact: magicthecrest at gmail.com. Magic The Crest is the story of four ten-year-old girls who receive a prophecy at their schoolyard to travel to Oregon to save a girl lost on Mt. Hood. After a successful rescue, the five embark on an adventure across the universe in search of The Crest. The girls discover they are "Magics," endowed with the elemental powers of earth, storm, fire and ice. On their adventure, they befriend shape-shifting dragons, a wolf-dog, talking chipmunks, and a fire cat, who keep them company and aid them in battle. The girls succeed in collecting gems they need for their quest, but only after together escaping foes like the hypnotizing green ball of terror, an army of three-eyed flesh-eating eels, and a giant bear King with a hankering for a fight. Rena came home from fourth grade one day in October 2013 with the assignment to finish a story. But she wanted to write an entire book based on the imaginary game she played at recess with her friends. For support, she signed up for NaNoWriMo’s Young Writers Program, and on November 1, set her word-count goal to about 20,000. She wrote five hours a day during November to finish the competition. The book was published soon after using Amazon's CreateSpace platform. Every November, the Young Writers Program is used in classrooms across the country, or kids can participate on their own, like Rena did. Rena Marthaler lives in Portland, Oregon. She is a compulsive reader with a list a mile long of books TBR, including any books written by young writers. She loves her two dogs, playing guitar and basketball, Girl Scouts, Minecraft, and inventing recipes a la Chopped. 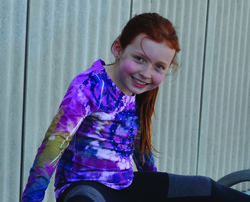 Rena was featured in the January, 2015 issue of American Girl magazine, has spoken about writing in classrooms, at Bay View Mission in San Francisco, and at Cloud Cap Games in Portland to share the student-created board game based on her book. For NaNoWriMo 2014, Rena wrote the sequel to Magic The Crest and is currently editing it.